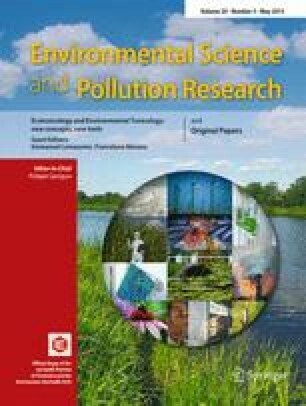 The objectives of this study are to track the occurrence, distribution, and sources of phenolic endocrine disrupting compounds (EDCs) in the 22 rivers around Dianchi Lake in China, to estimate the input and output amounts of phenolic EDCs in the water system, and to provide more comprehensive fundamental data for risk assessment and contamination control of phenolic EDCs in aquatic environment. Six phenolic EDCs were systematically evaluated in water and surface sediment in the estuaries of those rivers. The water and sediment samples were preconcentrated by solid-phase extraction system and microwave-assisted extraction system, respectively. Phenolic EDCs were analyzed by GC-MS (Thermo Fisher Scientific, USA) after derivatization. Phenolic EDCs were found ubiquitously in the aquatic environment. The total concentrations ranged from 248 to 4,650 ng/L in water, and 113 to 3,576 ng/g dry weight in surface sediment. The residue amount of phenolic EDCs in Dianchi Lake was 258 kg/a. Concentrations of the phenolic EDCs in the Lake decreased with increase in distance to the estuaries of those rivers which run through urban and industrial areas. The rivers seriously contaminated by phenolic EDCs were Xin River, Yunliang River, Chuanfang River, Cailian River, Jinjia River, Zhengda River, and Daqing River which run through the old area of Kunming City. Satisfying correlations were observed between the concentrations of the target compounds in water and in surface sediment. NP1EO, NP2EO, and BPA were identified as the three predominant phenolic EDCs. There were significant correlations between phenolic EDCs and many basic water quality parameters. Urban and industrial areas are the major contributors for phenolic EDCs, especially in Kunming City. Compositional profiles of phenolic EDCs in surface sediment were similar to those in river water. The concentrations of phenolic EDCs in the rivers located in the northwest part of the valley were very high, and posed a potential risk to aquatic organisms and even human. The concentrations of NP2EO, NP1EO, and BPA were at moderate levels of other areas. The basic water quality parameters (TOC, TN, DO, and pH) play important roles on the distribution, fate, and behavior of phenolic EDCs in the valley. This work was supported by the National Natural Science Foundation of China (grant no. 20767002), Environmental Protection Commonweal Scientific Research Foundation of China (grant no. 200809136), Yunnan Provincial Natural Science Foundation (grant no. 2007B035M), and State Key Laboratory of Environmental Chemistry and Ecotoxicology, Research Center for Eco-Environmental Sciences, Chinese Academy of Sciences (grant no. KF2008-09).